Annotating is the most natural way to organize and remember the content you read. You can go back to it later and quickly recall the general concepts, plot, and themes of the text. "Right" annotations also helps you develop a deeper understanding of the text, whether it is a professional article or best-selling fiction. PDF Expert is the best tool for this task. 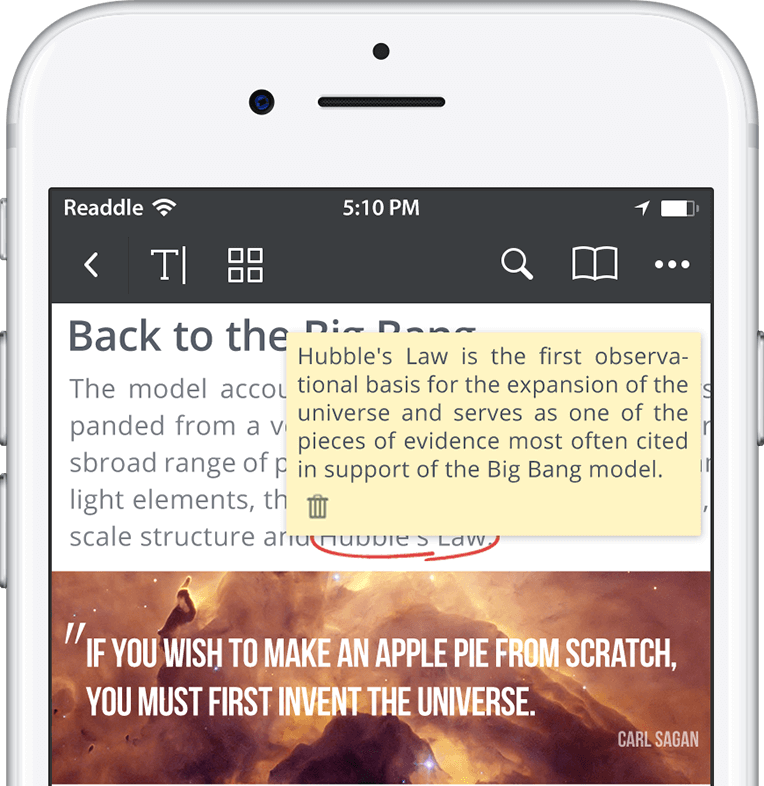 It's a fast, robust and beautiful PDF reader for all Apple devices: iPhone, iPad and Mac. Download it from the App Store and let's add some notes to your text! Let's take a closer look at all the tools you can work with. By using color to keep topic areas and sources distinct from one another, you can create a visual shortcut to exactly the information you need right when you need it, overlayed on the contents of the paper. Doing this saves a lot of page flipping and can make sure you don't forget key information while writing and revising. To highlight, underline or strike out the text tap , or . Then tap and drag on the text you'd like to annotate. To change the colour of the markup tap and hold on any of the markup tools, tap the highlighted text and pick Colors… from the popup. 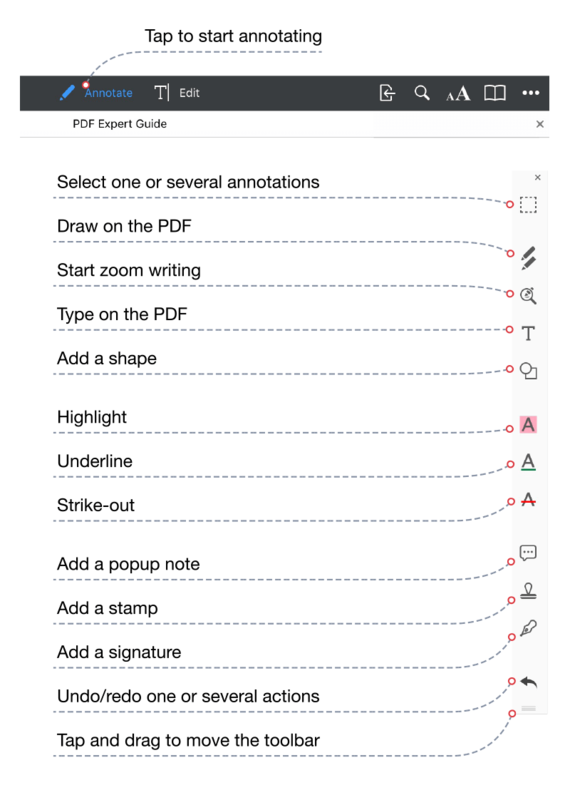 With PDF Expert you can draw on a PDF like on a regular text document, using only your finger. Draw or sketch anything desired! - 3D plans for construction, UX maps, financial graphs and many more. To start drawing simply pick tool, select your color, opacity and line thickness. PDF Expert remembers 4 most frequently used Pen patterns, so you can leave your mark in a record time. Don't worry if you added an extra element. Every mark could be easily wiped out from your PDF with Erase tool . Once done tap to hide the annotation toolbar. Create diagrams and schemes using shapes such as arrows, circles, rectangles and much more. The tools are interconnected and easy to combine. Adding different shapes can also draw attention to a particular part of your PDF. To add a shape click the button, select the shape you want to add, pick the color, line thickness and opacity and tap on your PDF to place your shape. Select a stamp from the Standard list. Note: To hide the annotation toolbar swipe horizontally across the toolbar away towards the edge of the screen. To reveal the annotation toolbar swipe horizontally from the edge of the screen. We all know the workflow: a collaborator sends a draft proposal or paper; we read it carefully; bleed all over it; and send it back. 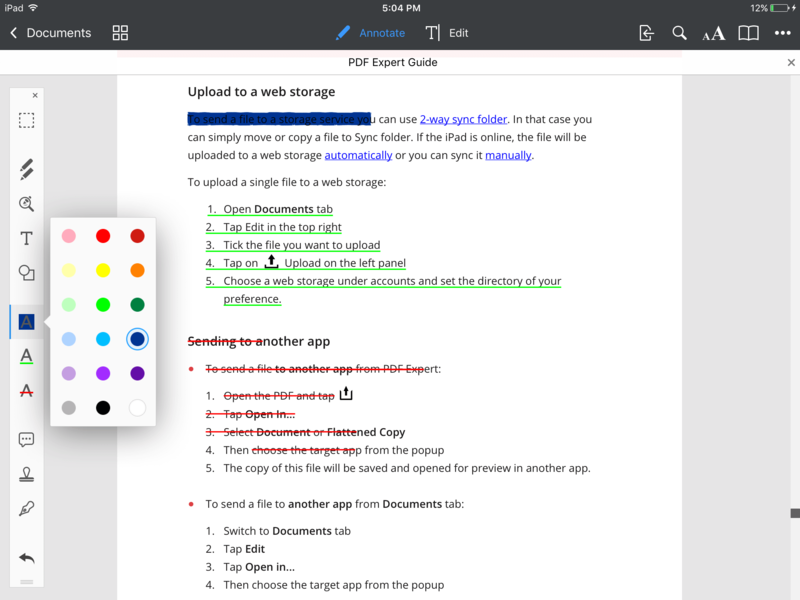 PDF Expert gets the job done when writing summaries or sharing feedback with coworkers. Popup note. Tap and then, tap on any place in the PDF to add a popup note. You can move the popup note afterwards by tapping, holding and dragging the note icon . Alternatively, you can create a popup note by tapping and holding on the PDF and selecting Note from the popup. To delete a popup note, open it first and then tap . Text note. Tap T and then tap on any place in the PDF. The keyboard will pop up and you’ll be able to type the text. You can use the tools at the top to change text style, i.e. select font size, color and family. Note: Tap Done to apply the note. To Undo tap . Tap and hold to Redo one or several actions. The Text tool analyses the PDF and tries to avoid overlapping the text and the graphics on a PDF. For instance, if you type on the margins, a new line will be automatically started once the cursor reaches the text of the PDF. When circles, arrows, boxes, and text edits just aren't enough to decry a document's problems or cheer its virtues, it's time to pull out the Sound annotation tool. So, let's see how to use it in PDF Expert. Now, when commenting on someone's PDF file, you can literally say, "This is wrong", or "Great idea!". 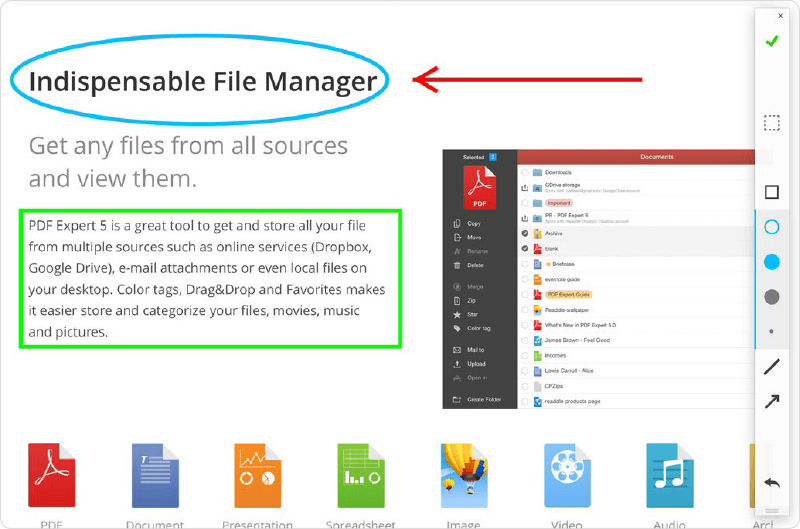 PDF Expert allows you to easily download only annotations from your PDF files. When you are working on a research, annotations and notes helps you to highlight the most important parts of the text and create summaries. Export them as a separate file, so you can quickly find what you need. That's it. Your annotation summary will be attached to the email as a simple text document. Done! Start marking up the way you want it. 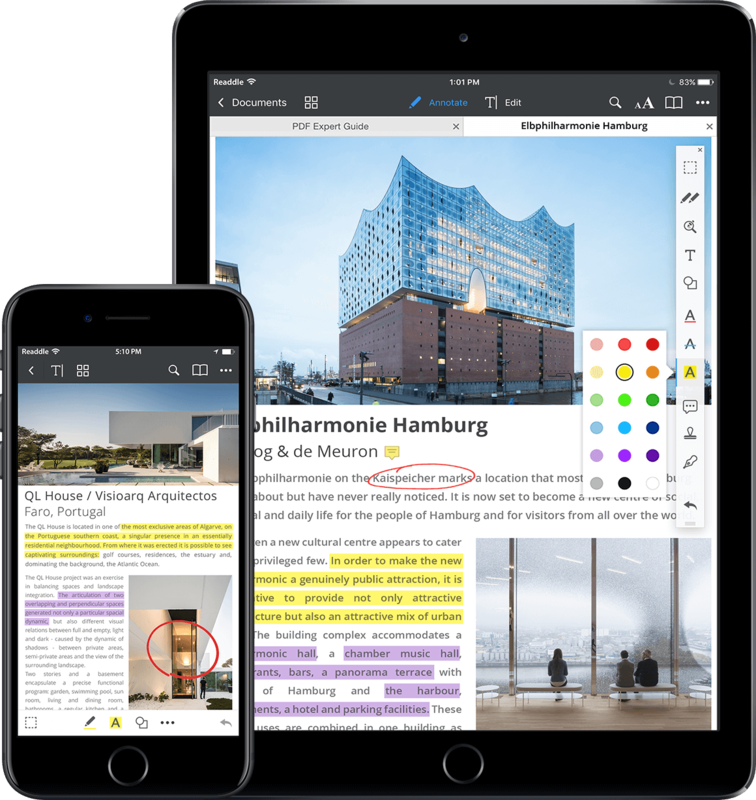 Bring your annotation sessions on a new level with PDF Expert. Download it now from the App Store and enjoy your experience.